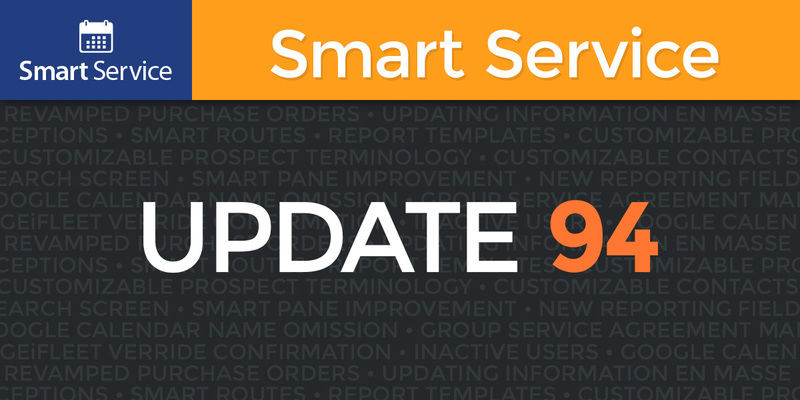 Released on April 15, 2016, Update 94 brings over a dozen great new features to Smart Service and iFleet. Peruse the list of exciting additions below. 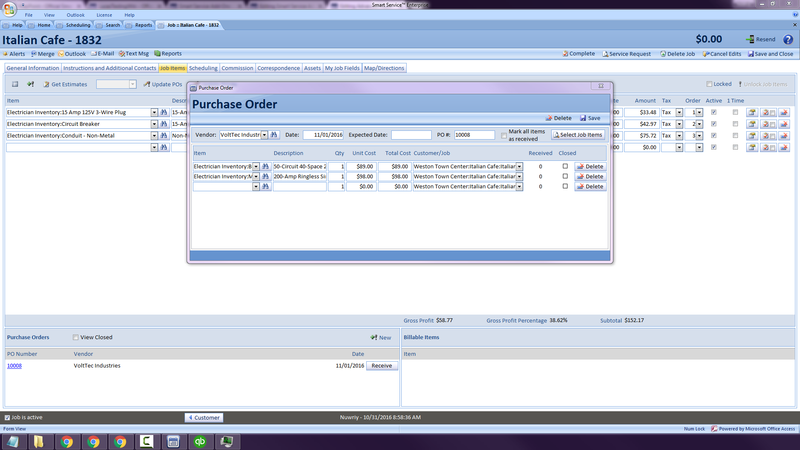 Revamped Purchase Orders – We’ve overhauled purchase orders! Open the job items tab, and Smart Service will display purchase orders, letting the user review pending and received items. Several new shortcuts encourage simpler creation of purchase orders. Updating Information En Masse – Perform bulk updates to job/customer information with the new “Copy Data” function. This utility updates specific information (like an email address) on every location and job for a customer at once. Job Exceptions – iFleet users can now mark jobs with a job exception when they have to leave that job unfinished. This sends a signal to office staff that additional work/attention (an additional trip, for instance) is needed before the job can be closed out. Smart Routes – The optional Smart Service routing add-on Smart Routes now features an interactive map and the ability to reorder, add, and delete stops. Smart Pane Improvement – The Smart Pane now displays relevant information for recurring jobs, including the date, time, and employee associated with the previous visit. New Reporting Fields – New equipment quantity/rate reporting fields help track customer equipment. Google Calendar Name Omission – When an address gets sent to Google Calendar, name information is removed to better facilitate accurate navigation. Group Service Agreement Mail Merge – Mail merge functionality has been added to the Service Agreement module. This allows a subscription reminder to be sent to all customers whose service agreements expire in a certain month. iFleet Override Confirmation – If a Smart Service user attempts to resend a job to iFleet, a new notice warns the user that doing so will override any changes made to that job in iFleet. Inactive Users – Inactive users are now hidden by default. Google Calendar Phone Numbers – When a phone call is scheduled, the phone number associated with that phone call is now added to Google Calendar. If you have questions about utilizing any of these new features, call (888-518-0818) or order additional training! Click to view the complete 10.94 release notes. Click to update Smart Service! To install a Smart Service update, you must be up to date on Support payments. To renew a lapsed Support plan (or for help installing an update), contact us at 1-888-518-0818 or click the button below.